Switchblades are stylish rail covers with kickstands for the Nintendo Switch. They easily slide into the console rails and lock in place. 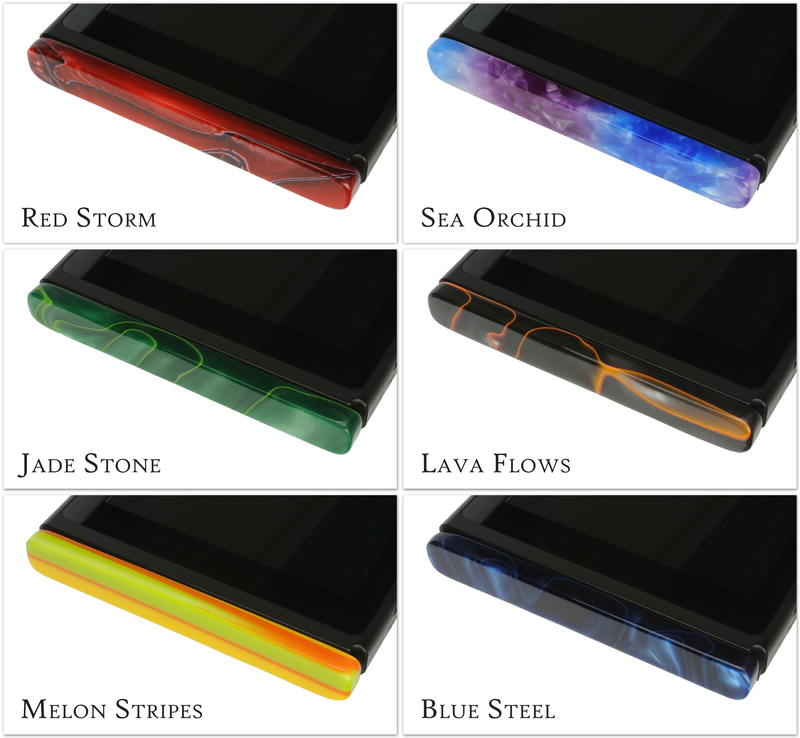 Switchblades protect the console's electrical leads from exposure, prevent damage to the rails if dropped, and give your Switch a very sharp and classy appearance. They have a built in kickstand that provides high stability and folds out of sight into the console profile. Switchblades come in over two dozen different styles including stately hardwoods, vibrant acrylics, and even an aluminum alloy design. Learn more about the Switchblade below! We use countersink screws along with a low-friction polymer to ensure that the Switchblades don't scratch or mar the black coating on the console rails. We only use solid hardwood; no cheap particle board with a fragile veneer! The wood is soaked with mineral oil to bring out its vibrant colors and coated with beeswax to provide a protective finish. We designed a positive locking mechanism that works with the console rails. The Switchblades install with a satisfying audible click and won't accidentally slide off the rails. We also designed integrated deployable kickstands that fold out of the Switchblades. Our positive locking mechanism is designed to slide into the rails with an audible click. It is easily removable with a single finger motion, yet it will not accidentally release itself. We tested the latch over 3,000 cycles to ensure that they last for many years of use. The Switchblades protect the electrical leads on the console from exposure. They stop debris from collecting unseen inside the console rails. If dropped, the Switchblades can prevent the rails from getting bent out of shape. The deployable kickstand is adjustable for different angles of viewing. It provides a superior viewing angle compared to the console's default kickstand. It is also much more stable and cannot be knocked over easily. If you don't like leaving fingerprints on the glass screen, the Switchblades also give you something to grab onto with both hands while you dock and undock the console. Listed below are all the pledge rewards. Each pledge receives a pair of fully assembled and tested Switchblades along with a small bag to store them in when not in use. 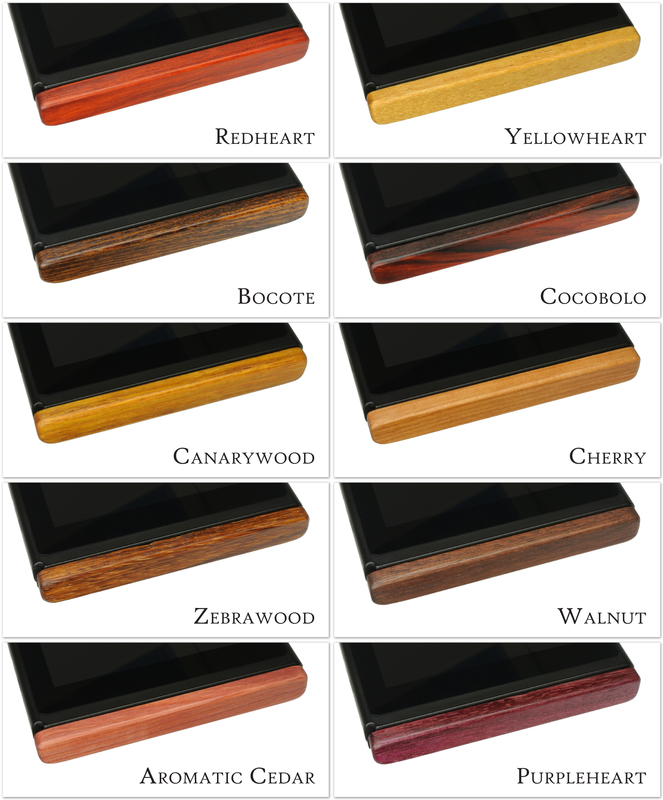 You will receive a pair of solid hardwood Switchblades in any of the ten wood choices below. These hardwoods are not stained; what you see are the natural colors of the wood. You will receive a pair of solid hardwood Switchblades in the special cherry and yellowheart hardwood pairing shown below (Pikachu and Eevee not included). 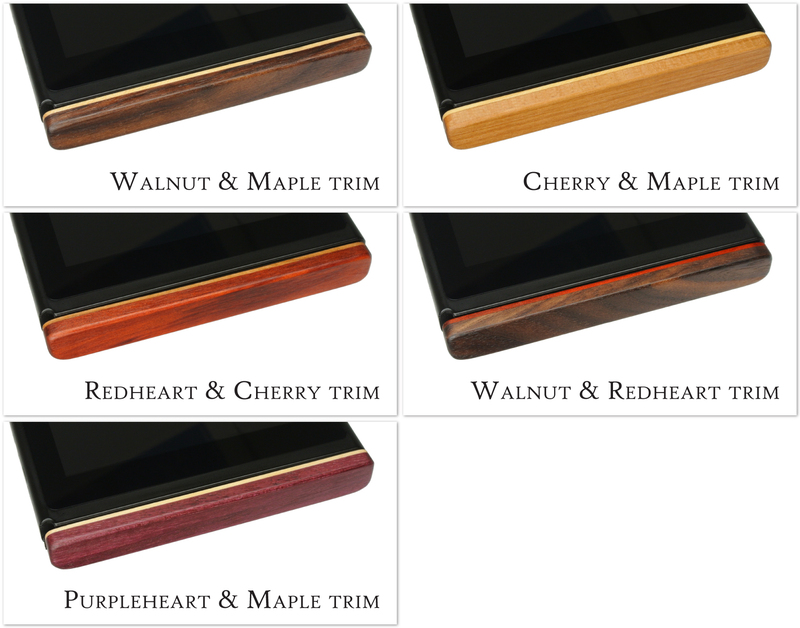 You will receive a pair of trimmed wood Switchblades in any of the five wood choices below. The Galaxy Line is a limited edition run of Switchblades made from acrylic acetate. 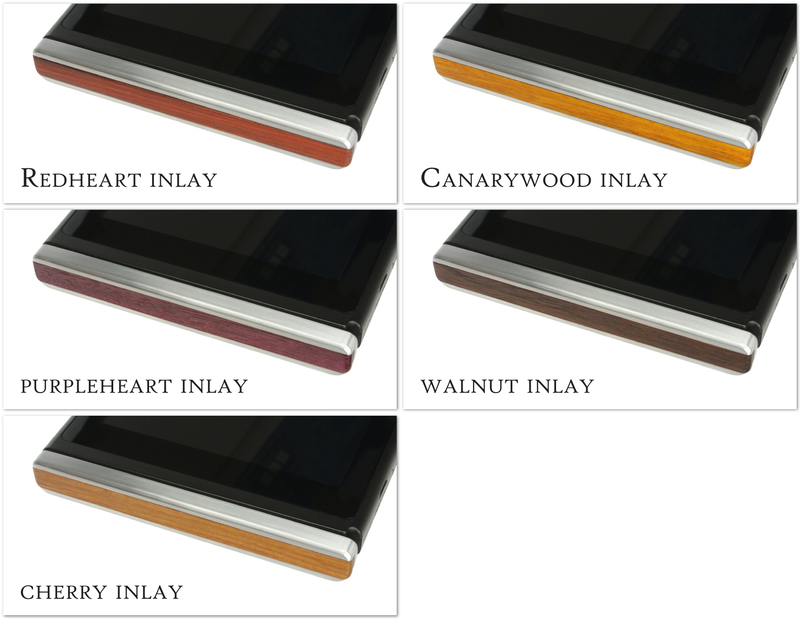 You will receive a pair of aluminum Switchblades inlaid with any of the five choices below. The idea for Switchblades was conceived in August 2018 and a working prototype was quickly made. The bulk of the work throughout September was industrial design: How to make the Switchblades with speed and quality, fine tuning the manufacturing process, and securing sources of raw materials. After the Kickstarter campaign has met its minimum goal, we will immediately begin building the manufacturing jigs and ordering the cutting tools to mass produce the Switchblades. Our friend, Austin, complained that his Nintendo Switch looked like it was broken or missing something when the Joy-Cons are removed. We recently purchased a Switch and noticed the same problem especially since we rarely play with the Switch in handheld mode. Thus, we created a pair of wooden rail covers to solve this problem. We were surprised at how sharp and classy the Switch looked with these rail covers attached. The kickstand feature was an idea proposed by the Nintendo Switch Reddit community. There are a lot of people who complain about the stock kickstand angle and stability. With our extensive experience in engineering and fabrication from our previous business, we saw an opportunity to produce these "Switchblades" for other people to enjoy. We need your help to bring the switchblade to market. We need to purchase cutting tools: Drill press, oscillating sander, end mills, router bits, drill bits, sandpaper, and polishing compounds. We need to purchase minimum quantity orders of materials: Nearly a dozen varieties of hardwood, plastic sheets, metal stock, and screws. We also need to develop various manufacturing jigs that will allow us to mass produce the Switchblade. Austin, for conceiving both the original idea and the name. Karl, for allowing us to use his home for photography shoots. MakerWorks, a maker space that provided the professional tools and work environment we needed to design and develop the prototype. The r/NintendoSwitch community on Reddit for suggesting the kickstand feature. Music: "BGC418" from "Seven Years of Server Data" by C418. We also want to thank our friends at Elderwood Academy for providing advice and guidance on setting up a business and a Kickstarter. They make fine wood tabletop gaming products and CCG accessories. Two of our basic hardwood choices, Bocote and Cocobolo, can be frangible if they aren't machined carefully. We have several methods of mitigating this issue. If we cannot develop an adequate fabrication process for these woods then we will offer a refund or a different choice of Switchblade style. Otherwise, we are confident we can deliver the product. The product was tested for over several thousand cycles and our fabrication plan was tested and timed on our machines. We have communicated with our material suppliers to ensure they can support our production. A pair of Switchblades from any of the 10 Basic Hardwood choices. A pair of Switchblades in Cherry and Yellowheart hardwood pairing for Pokémon fans. A pair of Switchblades from any of the 5 Trimmed Hardwood choices. A pair of aluminum alloy Switchblades inlaid with 5 different hardwood choices.